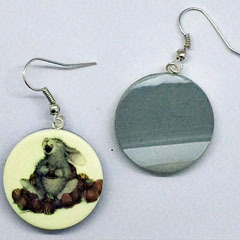 Our new line of HappyHopper earrings are created in the studio of clay artist Nancy Revoir Dezotell. 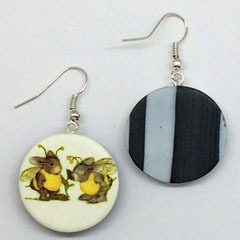 Each light weight earring is hand made by Nancy in a multi step process working with polymer clay and are finished by using silver hypo-allergenic findings. The back side has the look of marble. Our earrings are a perfect gift for all of your friends, family and / or just treating yourself. They arrive nicely packaged in individual gift boxes ready to bring a smile to the lucky recipient. Each earring measures roughly 7/8" diameter. Price per set: $19.99.